When you get items from the Spa Party Party Supplies, you'll be able to create a fun time for your girl and all of her friends! It's sure to look great when you add things like tableware, favors like props, paper masks, spa blowouts, and decorative items. You can also personalize banners, invitations, and gifts! What better way to celebrate the special day than by pampering your little girl from head to toe? Indulge in facials, pedicures, manicures and picture-perfect hairstyles. Little girls will absolutely love feeling so fabulous and grown up. And when it comes time to take pictures, they will adore their fresh new look. Each girl at the party is a shining star, so give all the little ones an opportunity to feel that way. With a chance to kick back and relax with the complete spa experience, she and her best friends will feel like a million bucks! Every spa has deliciously refreshing spa water. Be sure to keep your kiddos hydrated during the party. They can sip on healthy, pre-made drinks with fresh flavors that will taste great. § Take ideas from some of the world’s most stunning spas. With snacks, refreshments, activities and décor, you can easily borrow inspiration from countless places. And if you want to add a little pizazz to your spa by adding a personal spin, visit our Ideas Blog to add a twist to your party. Have guests make their spa appointment by sending in their RSVP. With beautiful invitations that tease the events to come, your guests will be eagerly counting down the days on the calendar until they can revel in their little spa day. o Just because Mommy’s spa experience is decked out in Zen neutrals doesn’t mean the birthday girl needs to stick to a bland color palette. 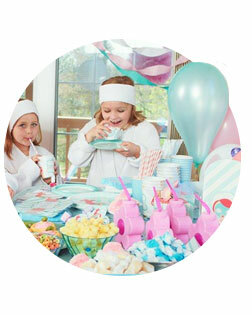 Get girly with the décor and make your little birthday girl feel like a pampered princess. Deck the house out in her favorite colors and playful spa images that keep the mood lifted and joyous. With a little help from festive décor like balloons and centerpieces, there will be no question that this is a spa with a party twist. Mommy may even be jealous that her spa doesn’t feature a little more of that festive spirit! These shimmering balloons are sure to catch your eye no matter where they fly. Mark each spa station with a set of these beautiful balloons so the girls will know where to go to get pampered. Take luxury up a notch by personalizing your greeting banner. It can be your own personal spa named after the girl of the hour! Everyone will be eager to get their turn at each station in the little birthday spa. Give every inch of your party the complete package. From the moment guests enter the door, they will be surprised at the attention to detail you put in to make this a truly special day. Even when it is time to nourish partygoers' bodies from the inside out, the plates, cups and napkins will perfectly complement the relaxing theme. The options are endless for your own special spa party. You don’t have to stick to typical spa activities, but you certainly can choose to throw some in the mix. Wear the girls out with plenty of high-energy fun and games, then let them settle down and sink into a relaxing spa experience. You will have a blast taking photos near this awesome wall décor setup. This fun bubble bath décor is sure to capture some genuine smiles and perfectly candid shots with interactive balloons to throw up in the air. Girls will certainly get the giggles when they put on these silly dress-up masks. Even when they are not relaxing they can play the part with fun paper masks. Guests will certainly want something to remember the special day by. Along with plenty of memories, give them something tangible to treasure day after day. Send guests home with their own spa package to re-create the great times they had at your little spa party. Let your guests take home more than just spa supplies. Little girls will feel like they are on top of the world with their new look and fun new treats, including stickers, blowouts, and mini games. Everyone loves to have a gift with a personal touch. Make sure each one of your guests knows their favor is extra special. Personalize each package with a favor that fits their style. Make sure to give your little spa party the most fabulous name – your own! Guests will feel welcomed with personalized décor. Celebrating in style means going a little over the top, so don’t hold back. Personalize everything from the tableware to the balloons! Whether they are walking in the front door or looking over the gift table, a personalized banner will provide that perfect finishing touch you have been searching for. Have a little surprise when you get down to the last bite of cake. As if that sugary sweetness weren't enough of a treat, all the girls will smile when they see personalized plates festooned with the birthday girl's name! Jazz up the tableware with personalized centerpieces to add the finishing touch. Whether they are at the cake table or one of the spa treatment spots, these fun spa images are the cherry on top. Every proper lady knows to send a thank you card. Be sure to send your thanks to each of your guests for sharing your special day with you. Add a special touch by including in the envelope a few photos that you took together at the party.